The common misconception around strategic alignment is it’s created in a perfectly structured environment where all long-term objectives, actions, and priorities fall into their natural place and a plan just becomes a cohesive roadmap for the future. We’re here to say this isn’t always the case. It’s messy, even chaotic at times. It requires your team to be the best strategic thinkers they can. And, most of all, it requires everyone to buy-in on the process. As you can see, alignment isn’t as precise as you think it’d be. It’s a wave of organized chaos, with each stakeholder providing their individual stamp and ideas on what Make-A-Wish needs to accomplish in the short- and long-term to achieve their vision. 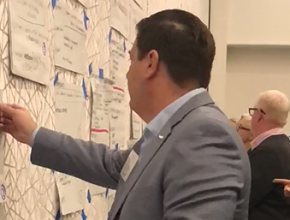 Embracing the facilitation of nearly 100 Chapter CEOs, board members, and national office staff allowed Make-A-Wish to bring a holistic view of their entire enterprise to the table to co-create the plan. The impact? A plan that matters not only for the national office, but also a plan for each individual chapter facing their own unique sets of challenges and opportunities. Allow your team to provide any strategic-level input they would like on sticky notes then put them on a wall for everyone to see. After everyone has provided their input, move each sticky note to quickly group common themes and ideas together. Facilitate a group discussion on the different areas of focus. Ask clarifying questions or ask the individuals who provided these areas of focus to discuss. As the group discusses and comes to different consensus, remove or add sticky notes as needed. Keep refining and condensing themes as necessary during discussion. Highlight any themes that are hot areas of interest. At the end of the session, take pictures of the wall and themes. Type notes and common occurrences from the group facilitation into a report format to take back to the strategic planning committee for decisions later. So, what’s the point? Facilitating these types of groups allows you to gather a holistic perspective of the strategic actions and areas of focus from the different perspectives of your stakeholders to help create a plan to reach your vision of success. These sessions aren’t designed to allow stakeholders to build the plan on their own. In fact, that’s counter-productive. The outcome from these groups is to have a plan that reflects the consensus of your team and to build a plan matters to everyone in the organization. It’s how alignment happens– it’s hard, it’s messy, and it certainly requires more work than just having a planning team create your enterprise plan. But it’s how everyone will buy into the process and help create alignment – no matter how large your organization may be. We’re excited to continue working with Make-A-Wish to help them create an enterprise-wide plan to achieve their vision of success. They impact the lives of so many and we are honored to be part of this process.